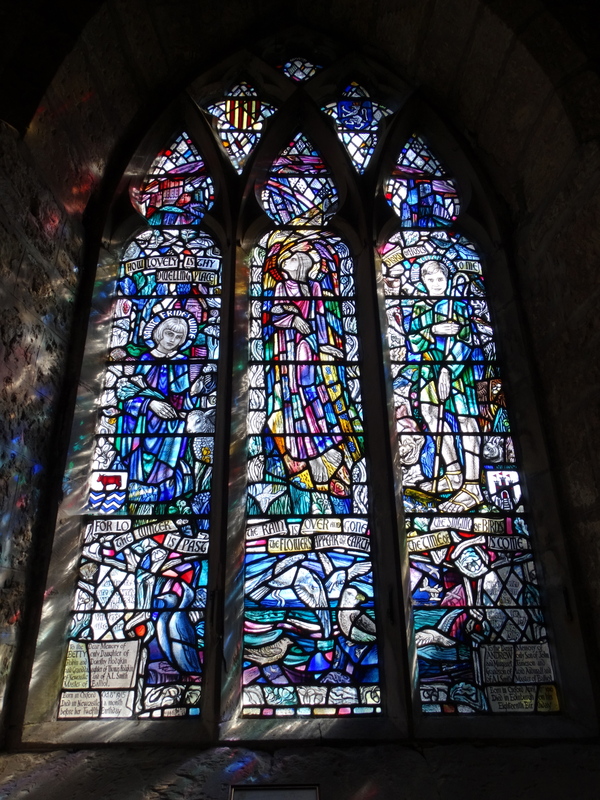 It was 2011 when I blogged about Bamburgh. I went back earlier this year but the photos weren’t brilliant. 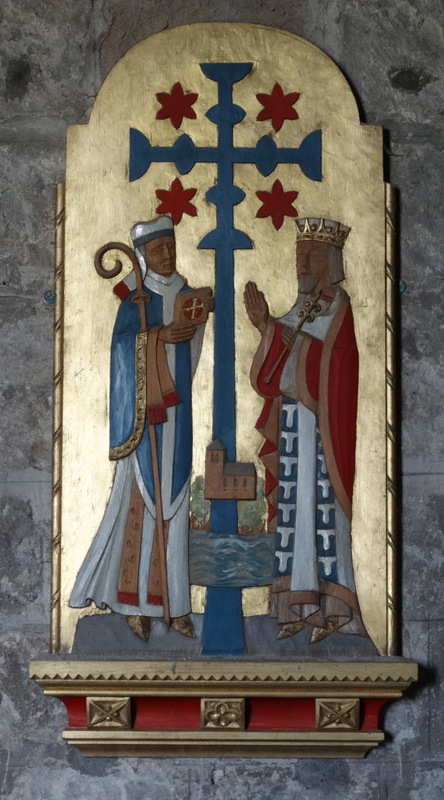 This coming Sunday (31 August 2014) is the Feast of St Aidan and I want to do an Evening Service about him (St Mary’s Ponteland at 6.30 pm). It was a lovely Tuesday afternoon, so we went for a drive. Bamburgh was busy. 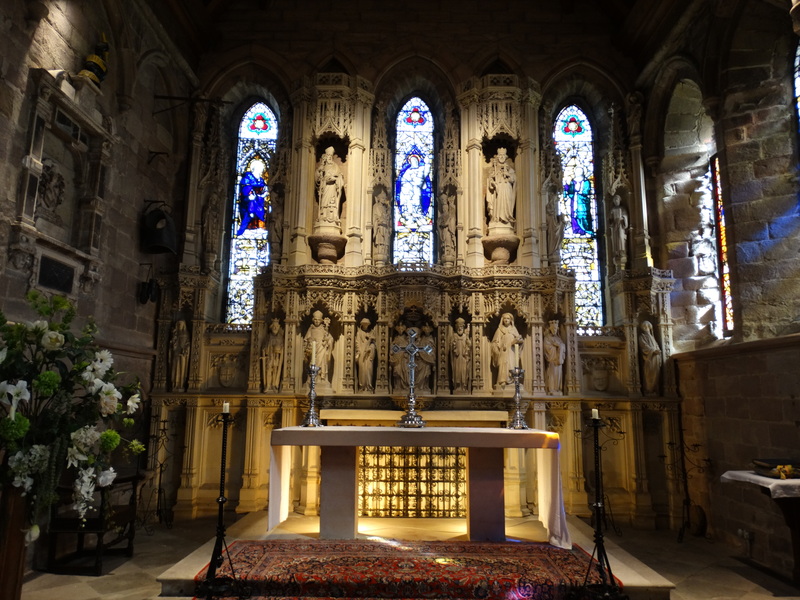 Since our last visit they have produced two new guidebooks, both by Christopher Hull, one of the church, another of the reredos. Very good, very colourful, but the first only does the church interior – I commented last time that I can’t work out how the church is put together; I’m still unsure. St Aidan built a church on this site circa 640 AD. It would have been a small wooden building with a thatched roof. 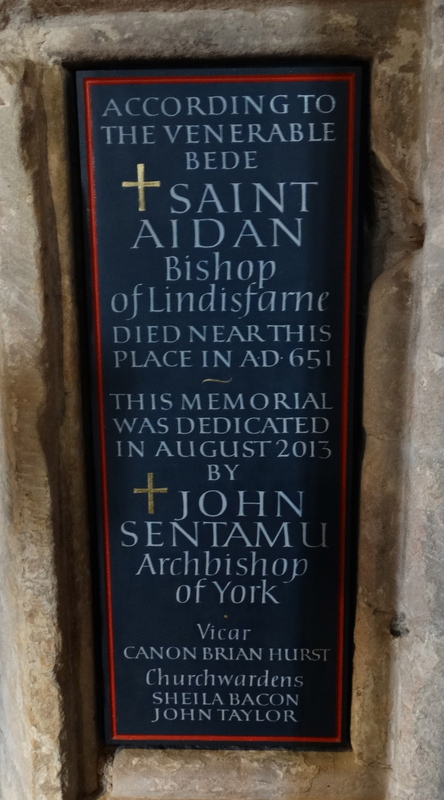 In 635 Aidan came to Lindisfarne from Iona. 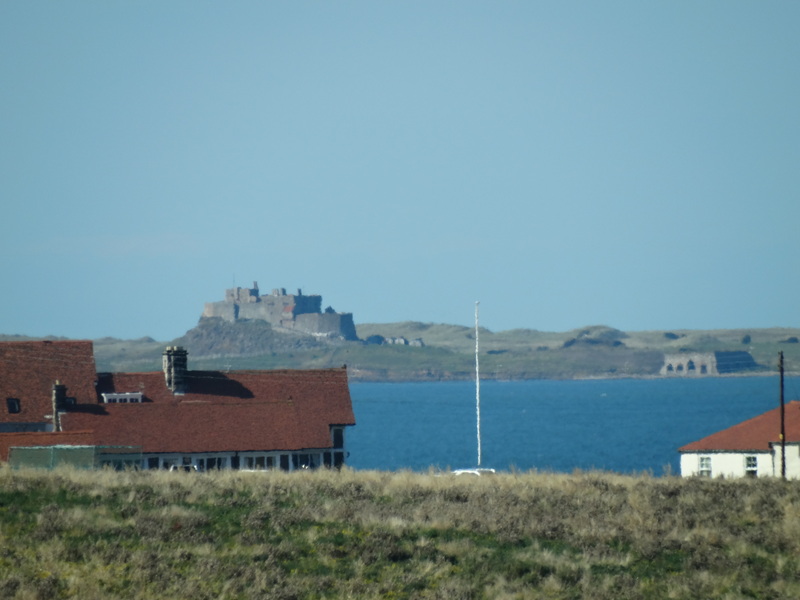 He was an Irish monk in the community established by Columba, and was one of the 12 who came to Northumbria at the request of King Oswald – the centre of royal power was the citadel at Bamburgh, Lindisfarne is just across the bay. 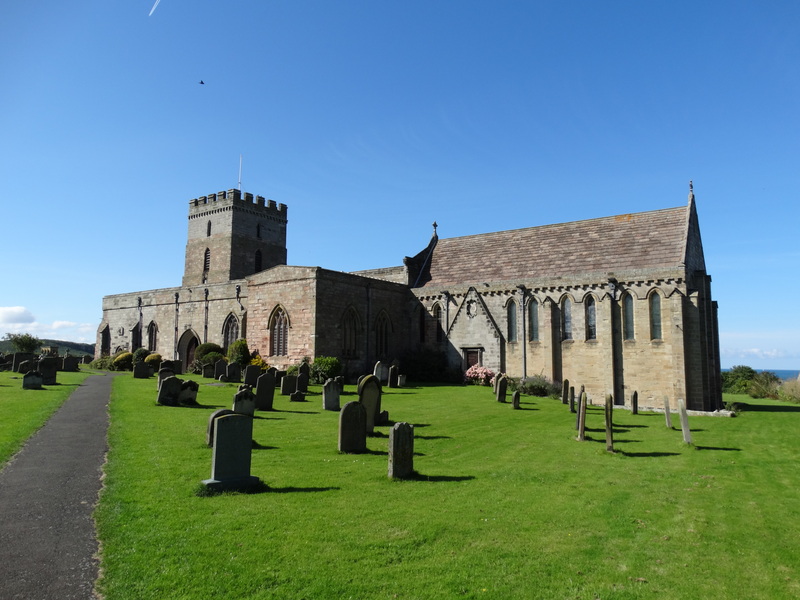 These photos were taken from the Grace Darling Museum just across the road from the church – you can see how close Lindisfarne is. 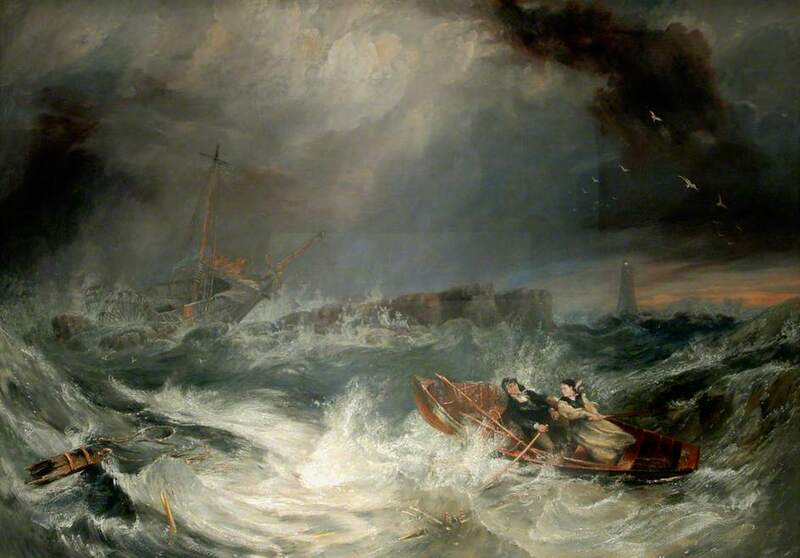 They also have a painting of the rescue by Grace Darling painted by John Wilson Carmichael. The community on Lindisfarne was an Irish-type monastery of wooden buildings; a small church, small, circular dwellings, perhaps a communal building, and various workshops. Here the monks lived a life of prayer, study and austerity, and went out on mission. They learnt the English language, walked the lanes, talked to the people, and tried to interest them in the faith. (One legend has it that Oswald gave Aidan a horse; he gave it away to a beggar). 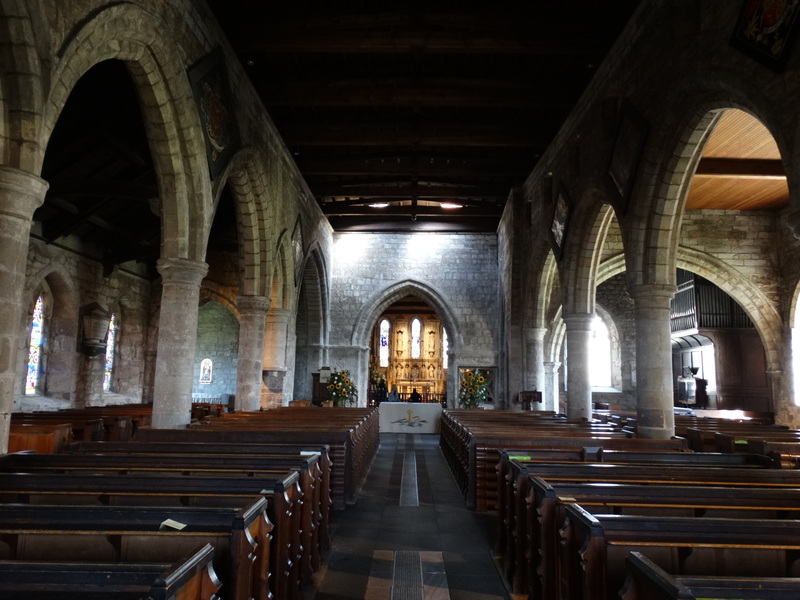 In time they formed Christian communities across Northumbria. Aidan also educated the next generation – book learning, reading, writing, Latin – this community would produce the lovely Lindisfarne Gospels. 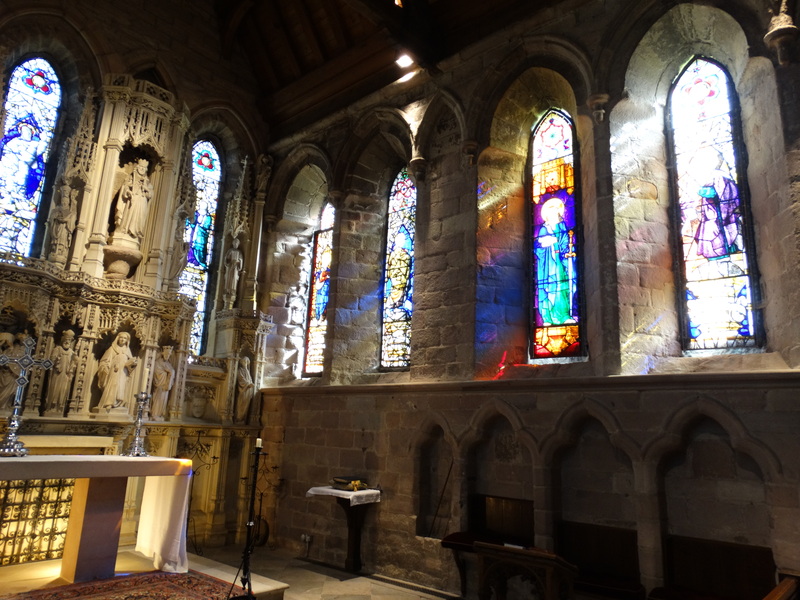 Back in Bamburgh church, it is a lovely building. 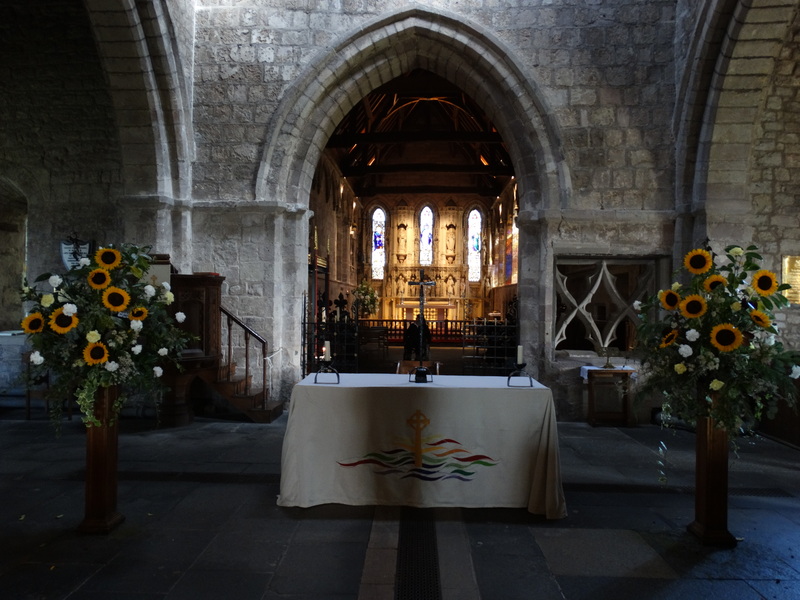 The altar frontal is quite pleasant, and the sunflowers work. 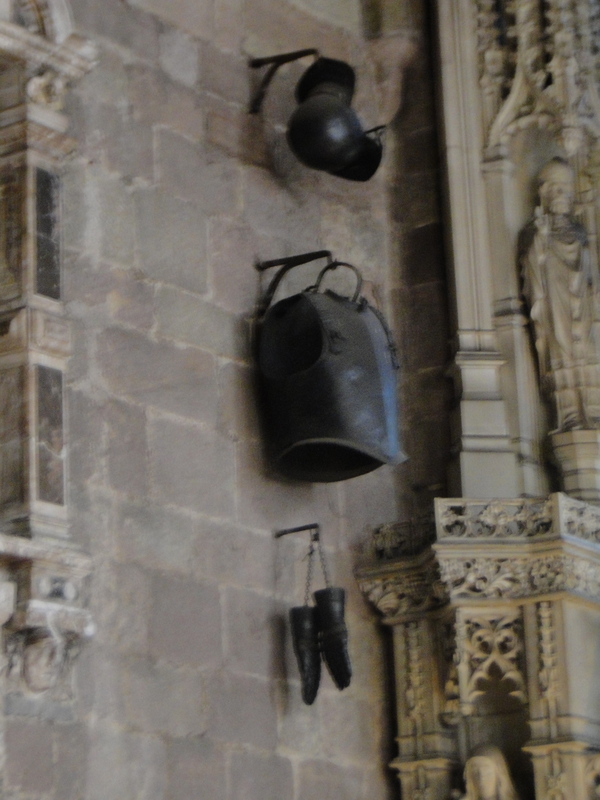 At the west end, above the font, is a beam in the roof. 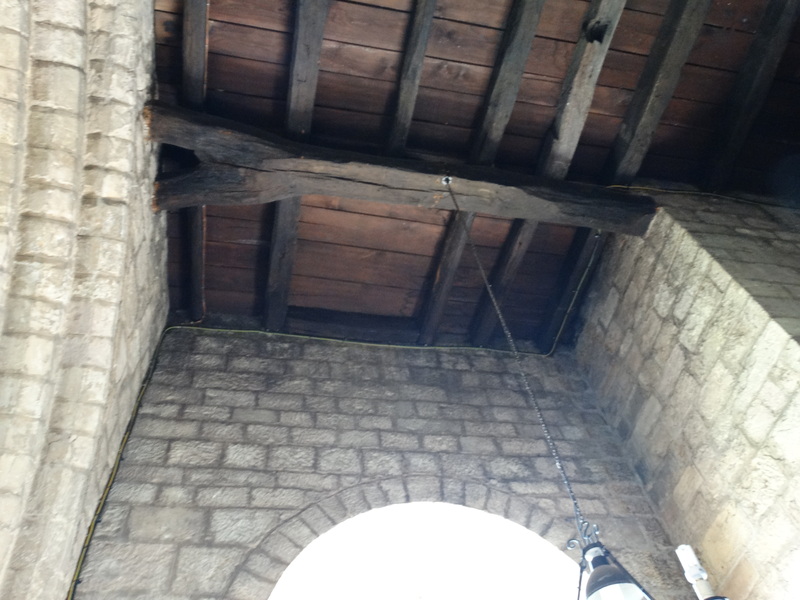 Tradition has it that it was against this beam that Aidan died in 651. Over the decades the church was burnt down on several occasions – heathens, Vikings, etc. – but the beam was never touched. (One of Aidan’s earlier miracles was that he saved Bamburgh citadel from destruction. According to Bede, the Mercians had heaped large quantities of timber against the well-defended walls and had set it on fire. 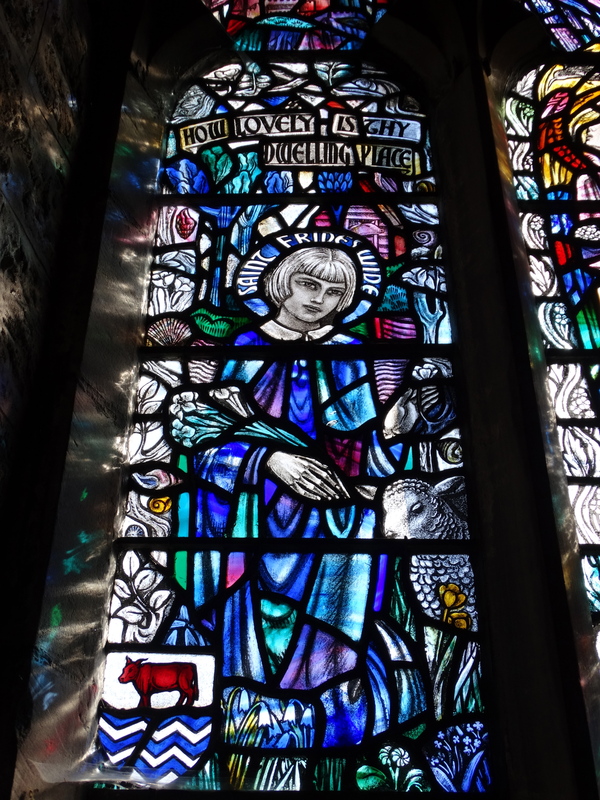 Aidan saw the smoke from his window on Lindisfarne and prayed for the wind to change direction. It did just that: the citadel was saved and the Mercians, recognising that they faced a greater power than their pagan gods, fled). 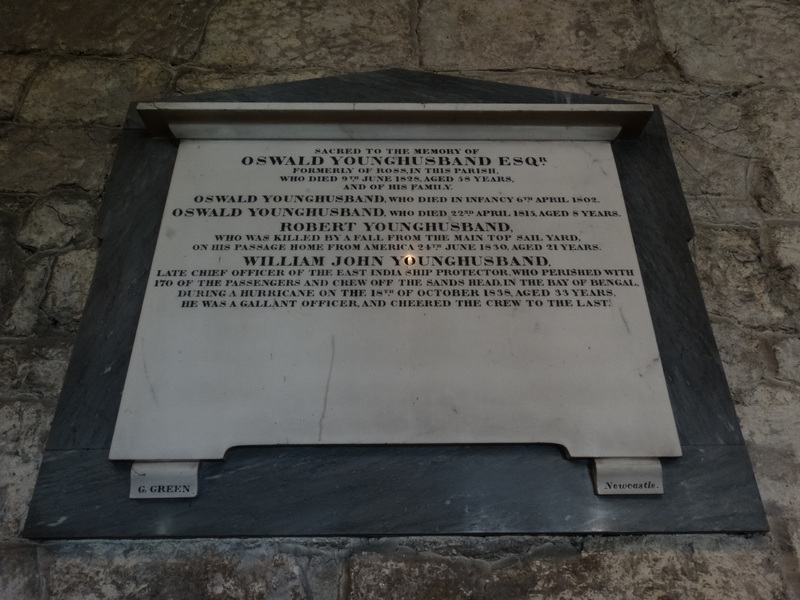 Here is a plaque of Aidan and Oswald. 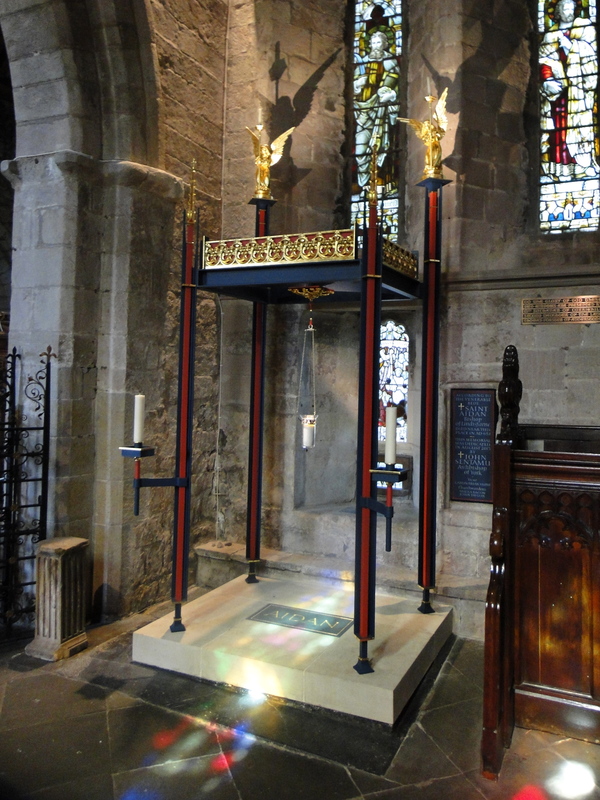 Last year a new shrine went in in the Chancel. 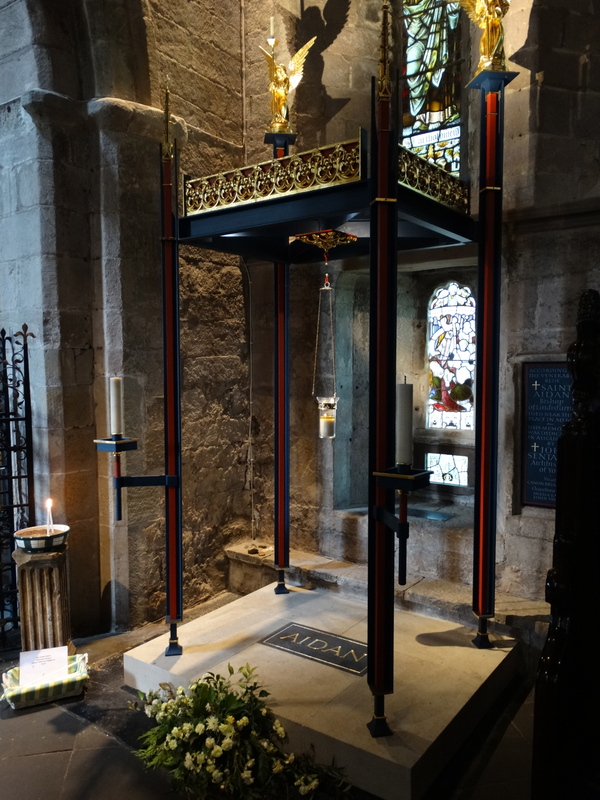 It was designed by Donald Buttress, Surveyor Emeritus of Westminster Abbey, and dedicated by Archbishop John Sentamu in August 2013. (I commented that I didn’t think the word “Sentamu” should be the same size type as “Aidan”). 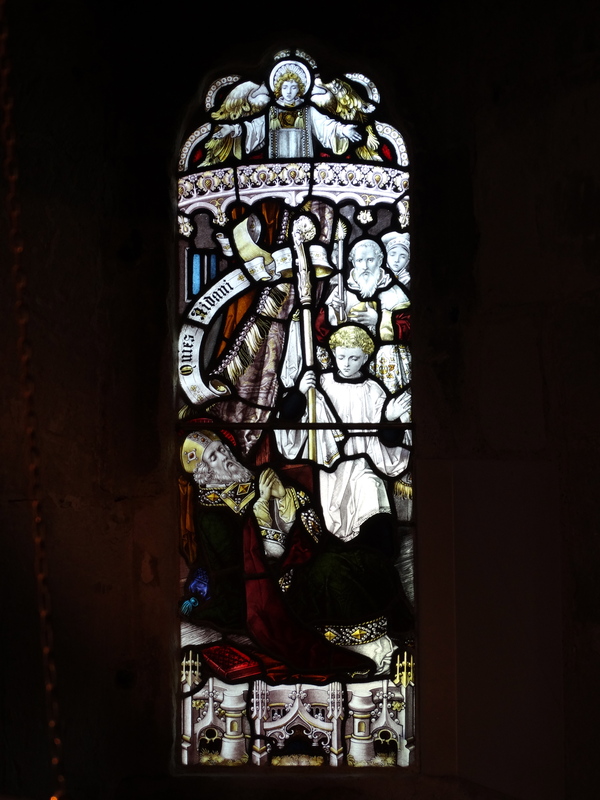 There is strong early C19 stained glass in the Chancel, which gave us lovely colours today. 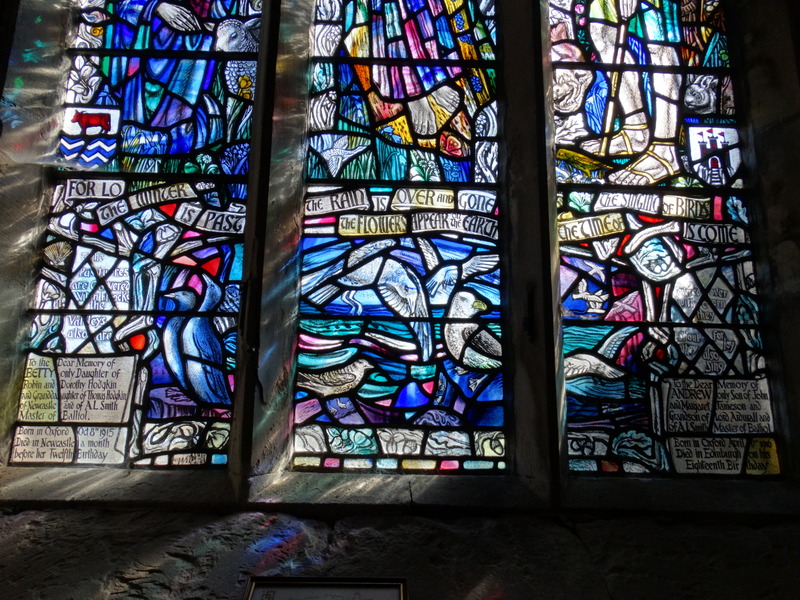 Behind the shrine itself is a small window depicting Aidan’s death beside the wall of the early church. The banner reads “Quies Aidani”, Aidan at peace. An angel spreads his arms, welcoming Aidan to heaven. 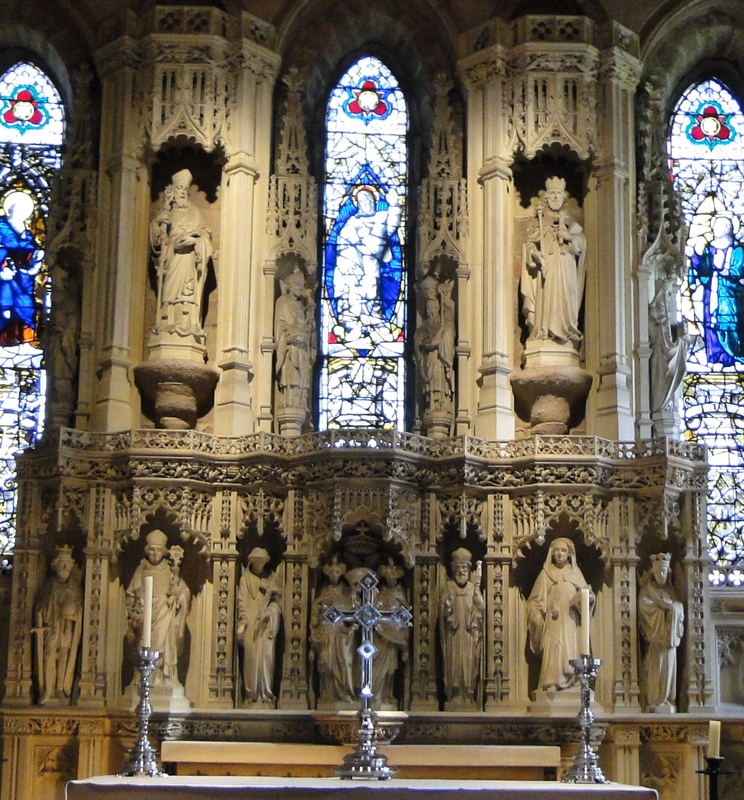 The Victorian reredos in Caen stone was designed and installed by William Hicks, architect to the Diocese of Newcastle. Aidan on the top left, Oswald on the top right. 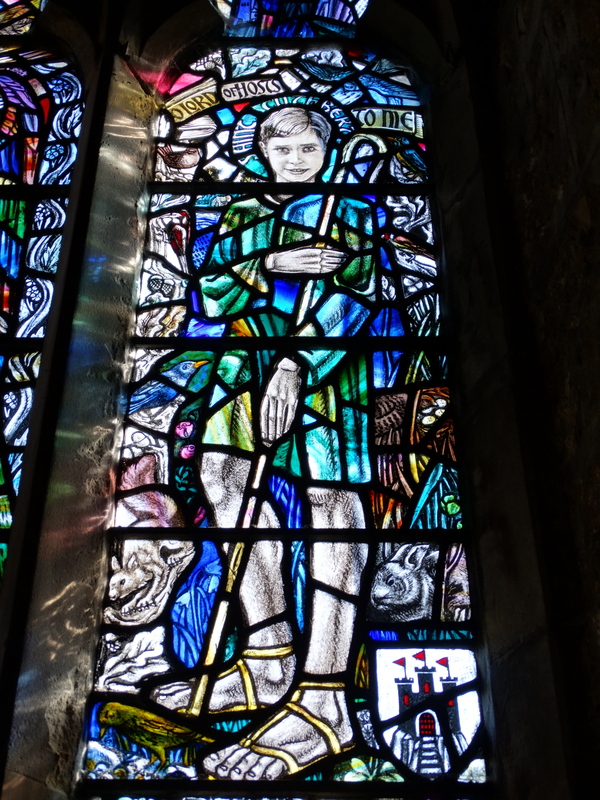 The different figures include Paulinus, James the Deacon, Hilda, Cedd, Chad, Eata, Finan, Cuthbert, Ebba, Egfrid, Bede, Ceolwulf, Eadfrid and Tosti. (The guide to the Reredos gives useful background of all of these people). On the north wall, just to the left of the reredos, are two pieces of armour. Last time we visited there were three pieces of armour. The helmet has now been stolen – no one seems to know when or how. They belonged to Ferdinando, son of William Forster (1636-74) – he and his brother both owned the Bamburgh estate. 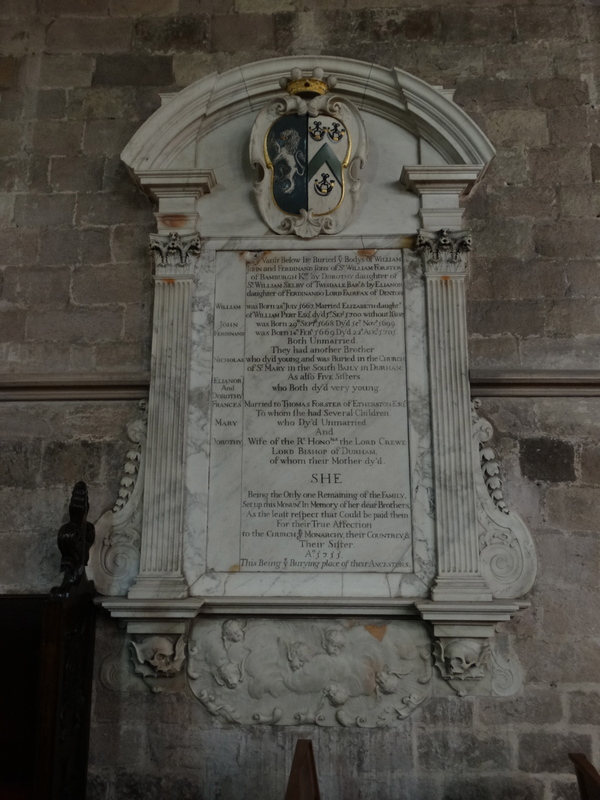 This memorial tells that Sir William Forster had four sons (including Ferdinando) and five daughters. I liked the figures at the bottom. 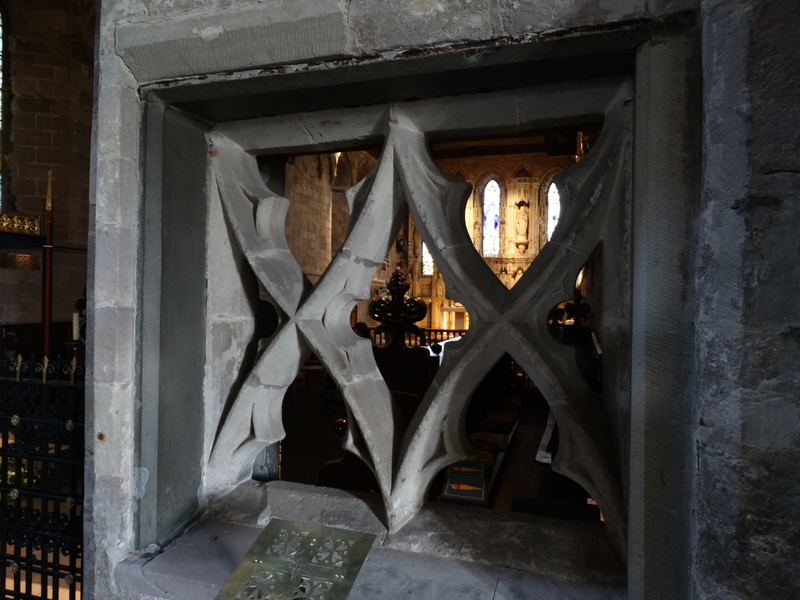 This aperture with carved tracery gives a view from the Nave into the Chancel. This squint gives a view, remembering that there would have been a rood screen in the arch. 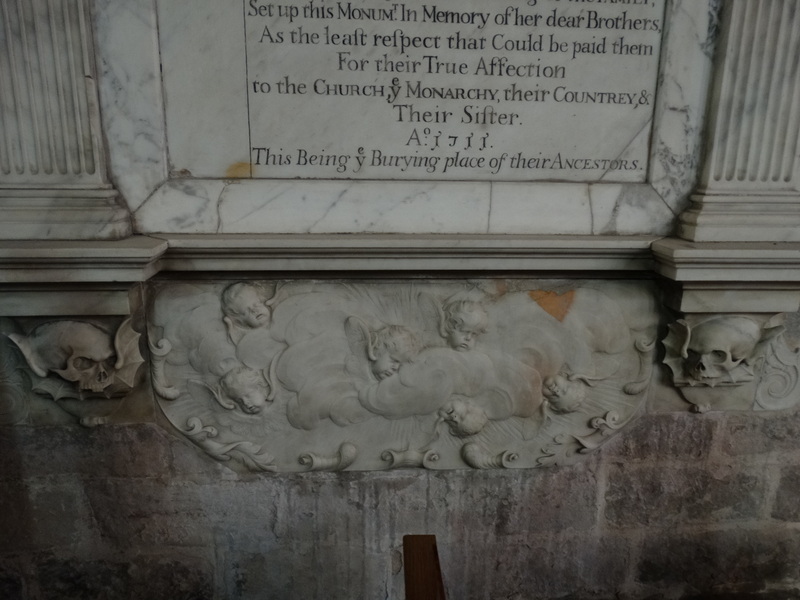 There are some fascinating memorials, and I photoed a selection. “Younghusband” is a good surname and the wording is worth reading. 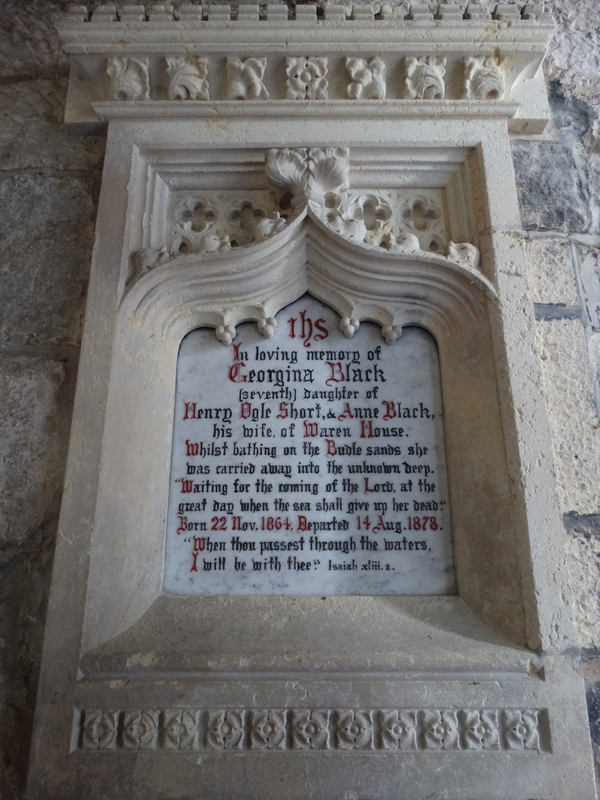 On the eastern wall by the organ is one to 12 year old Georgina Black who died while swimming at Budle Bay. 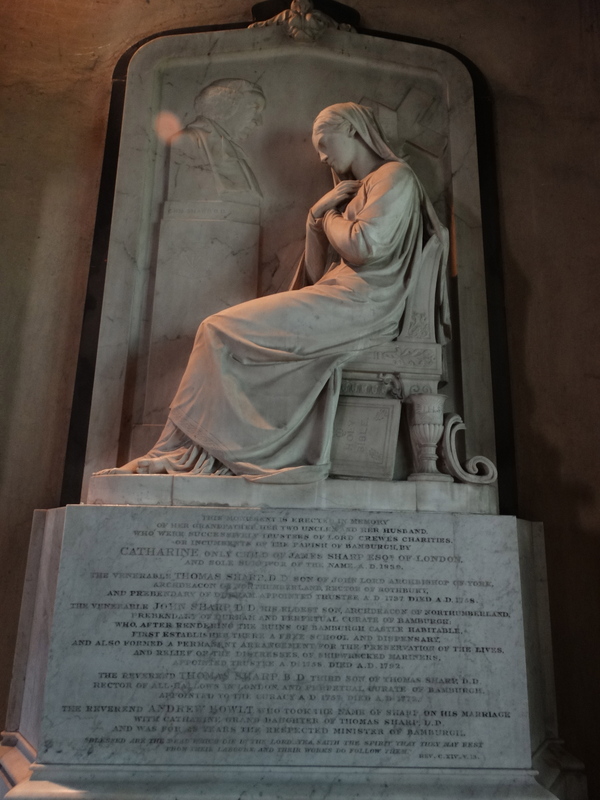 The seated lady memorialises members of the Sharp family notably John, Lord Archbishop of York who was the first trustee of the Lord Crewe bequest. Every cleric in the NE of England is very grateful to Lord Crewe. They also made the castle habitable, founded schools and created the coastguard service in this part of the world. 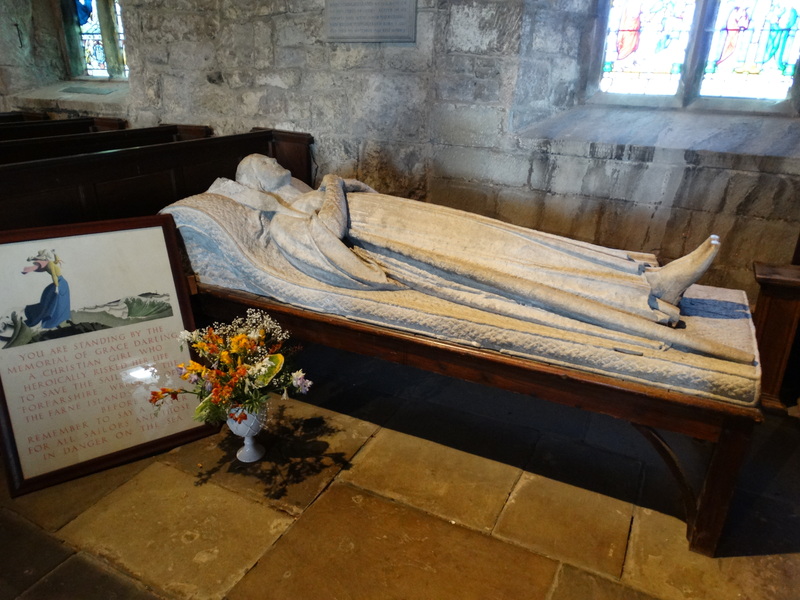 The bottom memorial is to Grace Darling. 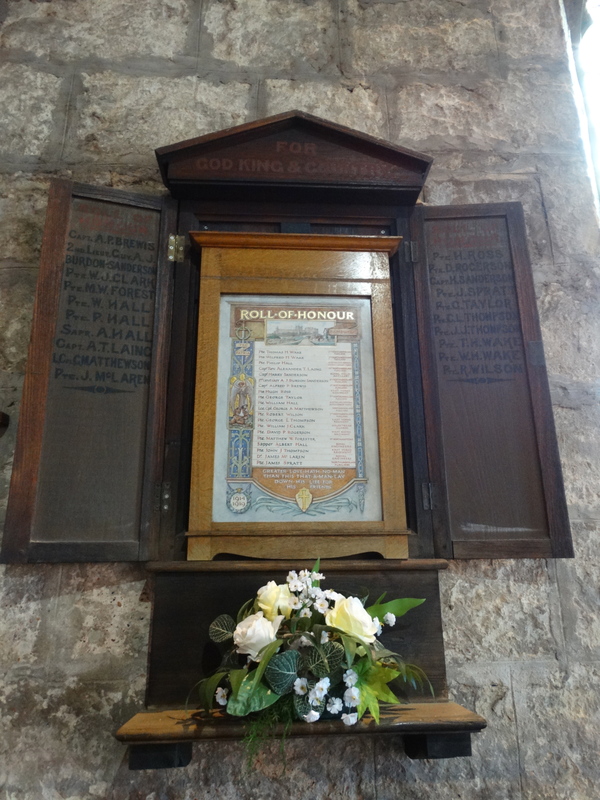 There is also a small memorial to those who died in the First World War by the church door – along with a second hand bookstall, which kept Julie quiet. 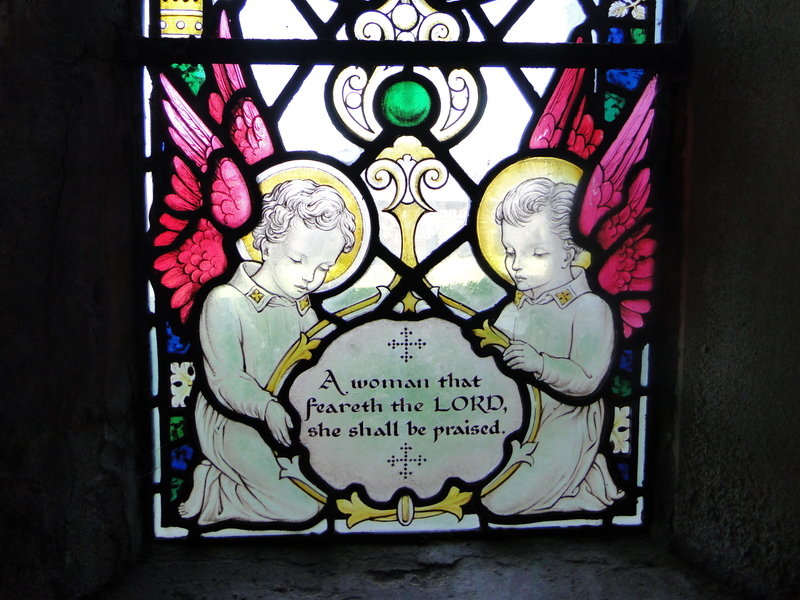 There are some lovely windows too. 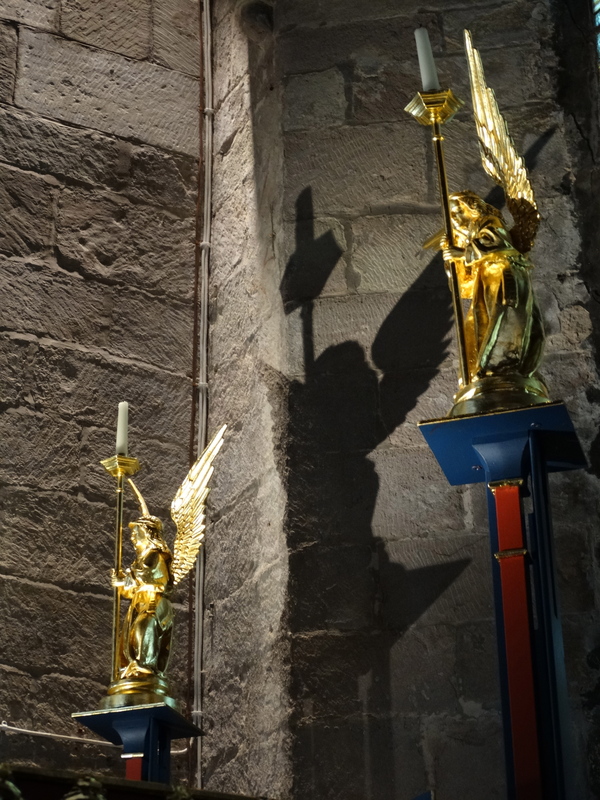 This one in the north transept is a memorial to Ann Rochester, and was installed in 1939 by Smith and Pawle of London. It is based on the last chapter of the book of Proverbs and portrays the many qualities of the perfect wife and mother. 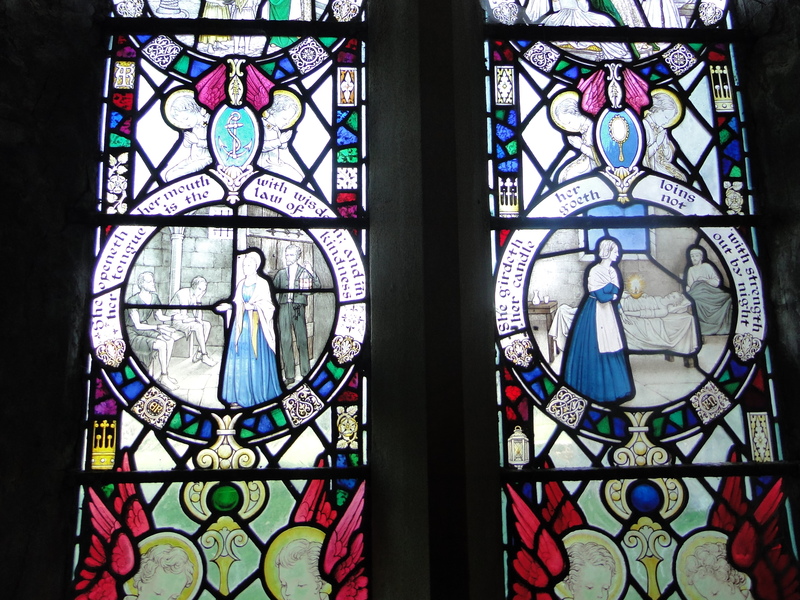 One panel shows Elizabeth Fry and Florence Nightingale, and I like the angels at the bottom. We had commented on the drive north that the leaves were starting to turn – it is still August, but I put a woolly blanket on top of the duvet last night! Winter is coming. 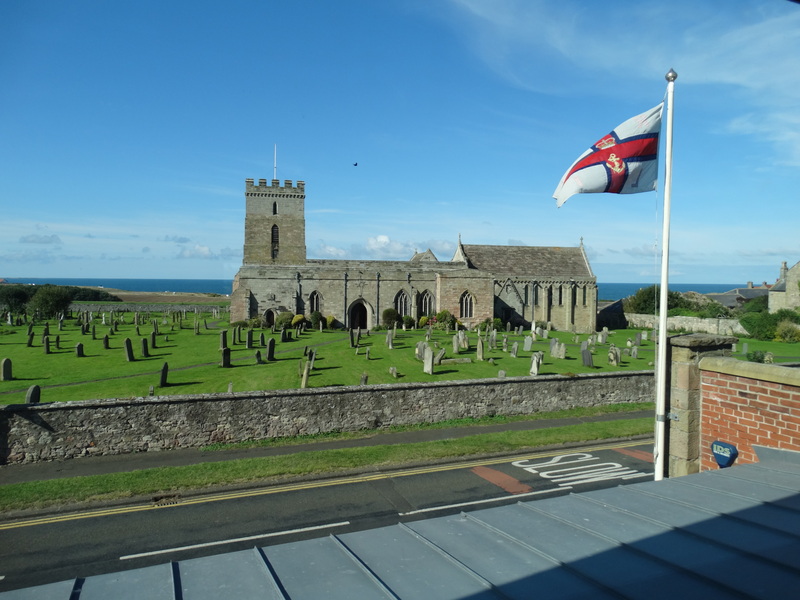 Thanks for your nice comments on the guidebooks – the next edition will be expanded to include the churchyard!